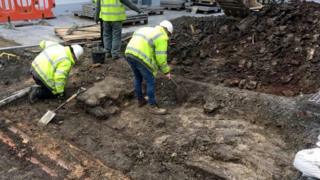 A section of wall belonging to what is thought to be a 14th century castle has been uncovered during work by contractors in Orkney. The Broad Street alterations work was being carried out in the centre of Kirkwall close to St Magnus Cathedral. It has now been temporarily halted while the find is catalogued by archaeologists. The old Kirkwall castle was originally built in 1379 to defend the town. It was demolished in 1614. Most of the stone was used in other building projects.